One of the common error in the Windows operating system that most users face is the Blue Screen of Death error. The Blue Screen of Death Error is also known as BSOD error and Stop Error. There are many stop errors that occur in the Windows operating system and when most of such errors occur, the system simply will freeze and stop responding ultimately crashing and the system will automatically restart or the user will be forced to manually restart the system. The BSOD error has been found in the Windows operating system since 1993, way back in the Windows NT 3.1 version of the operating system. The BSOD error or Stop Error is also present in the Windows 10 operating system and the 0x0000007F Stop Error is the latest stop error in Windows 10 that most users are facing. 1 What is the 0x0000007F Stop Error? 1.1 What Causes the 0x0000007F Stop Error? What is the 0x0000007F Stop Error? The 0x0000007F Stop Error usually appears in systems running the Windows 10 operating system and is displayed with a message that says “UNEXPECTED KERNEL MODE TRAP”. This message is nothing but an indication that the CPU of your system has just issued a trigger which the kernel was not able to respond to. The 0x0000007F Stop error usually appears after updating your Windows 10 system to the latest software version. 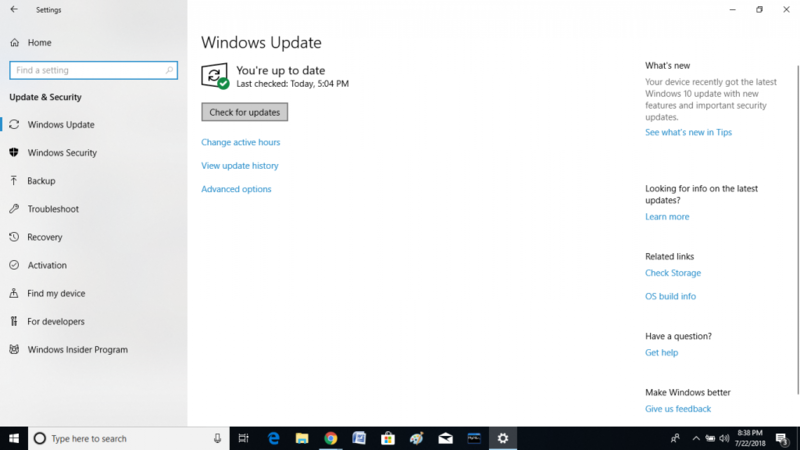 More specifically speaking, many Windows 10 users have faced the 0x0000007F Stop error after updating their system to the Windows 10 Fall Creators and Windows 10 Creators update. What Causes the 0x0000007F Stop Error? Failure in some hardware component or peripheral of your system. Incompatibility in the drivers installed on your system. Third-party antivirus or firewall software installed on your system. A huge amount of dust in the hardware components of your CPU. An issue in the RAM component installed in your CPU. If you are regularly facing the 0x0000007F error while using your Windows 10 system, then below are 6 different solutions to fix the error. First, disable the antivirus and firewall software that is installed on your system. If the error does not occur again, then the antivirus or firewall software installed on your system might be the cause of the issue. You can uninstall the antivirus or firewall software from your PC and the issue should be resolved. Press the Windows key + I key on your keyboard to open the Settings application. Now click on the option that says “Update and Security”. Click on the “Check for Updates” option. Wait for some time. If there are some updates for the Windows operating system, it will be automatically downloaded and installed now. Now check if you are facing the error. Click on the Search Bar located in the bottom left corner of your taskbar. Type “Control Panel” and press Enter to search. From the results, click on “Control Panel” under “Apps” section. When the Control Panel window opens, find the “Hardware and Sounds” option and then click on the “View Devices and Printers” option below it. Find the name of your current PC and then right-click using your mouse on the PC name. In the drop-down that appears, click on the option with the title “Device installation settings”. In the window that opens, select the “Yes (recommended)” radio button. Click on the “Save Changes” option in the bottom right corner of the window. All the drivers installed on your system will now automatically get updated and this should solve the error. Press the Windows key + X key on your keyboard. From the drop-down menu that appears, click on the option that either says “Command Prompt (Admin)” or (Windows PowerShell (Admin)”. A Command Prompt window will now appear. Type in the command “chkdsk /r c:” and press Enter. 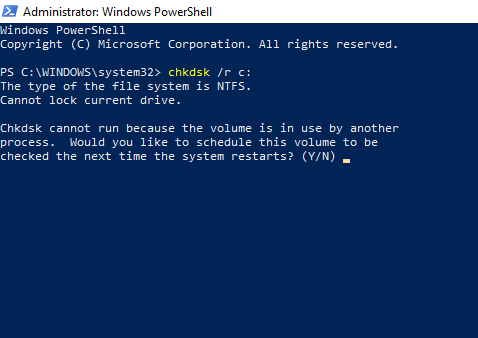 You will get a prompt asking whether to schedule a disk check for the next time you restart your computer. Press the “Y” key on your keyboard to confirm. If there are other drive partitions on your system, repeat Step 5 and Step 6 but replace “c” with the drive name in Step 5 and press Enter. A disk check will begin the next time you restart your PC. Any disk related issues should then be resolved. Check if the error is fixed on your system. Disconnect your PC from any power source/battery. Remove the cabinet cover of your PC. Find the RAM component and remove it from your PC carefully. Connect back the RAM component in your PC. Fix the cabinet cover back. Power ON your PC and check if the error is resolved. Disconnect any peripherals like mouse, printer etc., connected to your PC. Remove the cabinet cover of your CPU. Take a clean and soft brush and clean the dust in the interior of your CPU. Make sure not to damage any PCI components of wire. Be soft while brushing the dust out. Put the cabinet cover of your CPU back. Power ON on your PC. Check if the error is now solved. The above mentioned 6 solutions to fix the 0x0000007F Stop Error or BSOD Error in Windows 10 is the commonly recommended solutions for the 0x0000007F Stop Error. We hope that some of the above methods helped you in solving the error. If some other method helped you in fixing the 0x0000007F Stop Error in your PC, then do comment the solution that worked for you in order to help others as well.